You love wine. You spend a lot of time drinking it, thinking about it, and buying it. You’d love to start a real collection rather than stashing the bottle haphazardly on a rack in your kitchen, but you live in a small loft apartment. There’s hardly enough room for your stuff, let alone enough empty space for a wine cellar or even a wine refrigerator. Your dreams of a great wine collection have been dashed against the rocks of your cramped reality. Right? Wrong. 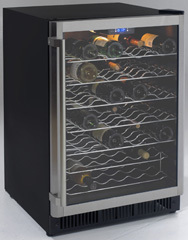 This Avanti wine chiller holds 52 bottles and can be built into your cabinetry. A lack of space doesn’t make collecting wine impossible. You just have to get creative. Many reputable wine refrigerator manufacturers also make small wine cabinets that are perfect for the collector with big dreams and small spaces. These wine cabinets are just like their full-sized counterparts: they are outfitted with high-tech humidity and temperature controls designed for wine storage. Storing your wine in the proper environment is what makes it age well. The right climate will provide a cool, moist place for your bottles, letting the reactions between the chemicals in the wine, which give properly aged wine its rich, nuanced flavor, a chance to happen. Wine cabinets keep these same chemicals from being adversely affected by light, humidity fluctuations, and vibrations, thus protecting your investment and helping ensure that when you finally open that bottle of Cabernet, it will have been worth the wait. There are a variety of different wine cabinet sizes out there, each one perfect for a unique storage situation. There are wine cabinets out there that hold 200 bottles or less. For sincerely limited storage space, there are even wine cabinets that can fit under the counter in your home or restaurant—they’re only about 30 inches high, and they hold 30 bottles. Avanti makes several wine refrigerators with a compact design that can be freestanding or be easily installed under a counter. They have a sleek, modern look and digital controls that allow you to adjust the conditions inside the cabinet with the touch of a button. 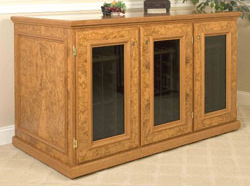 Another option for the space-challenged is a wine credenza. A credenza is a long, low cabinet that is usually seen in a dining room. Some companies make credenzas in luxurious woods with beautiful detailing—you can place them alongside a wall in your dining room and they are both a practical and beautiful way to show off your collection. Since the credenza performs double duty, it is a great way to save space. The top of the credenza can be used as a sideboard for serving food, as a bar area, or as a place to display your fine china or other kitchenware. Vinotheque makes some of the most functional and aesthetically pleasing wine credenzas out there. Moral of the story: don’t be deterred from collection because you don’t have the space. Think outside the cellar and check out some of the great solutions for wine storage in small spaces that are out there.